Is Whole Wheat Pasta Healthier than Regular? 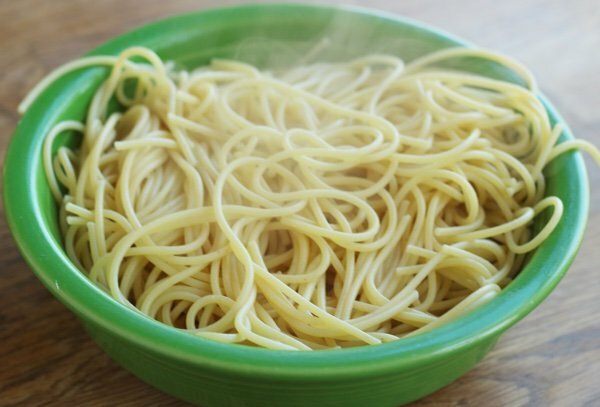 Is whole wheat pasta healthier than regular? 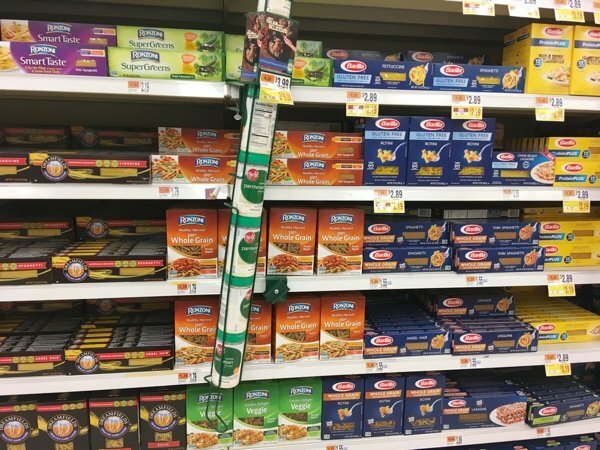 What about all the other pastas that you can find on the shelf? The pasta aisle has exploded in recent years to include all sorts of products - gluten-free pasta, pasta made with vegetables, bean pasta, and high protein pasta. I was amazed at how much this has changed in the last 10 years. I happen to like zucchini noodles -how to make zoodles and putting lentils on my pasta instead of using pasta made with lentils - lentil pasta sauce. I have been eating whole wheat pasta as my only pasta for a while now. I like this brand and find the taste quite nutty. The flavor of the pasta does not distract me from the taste of the sauce (which is what pasta is all about). I believe that whole wheat pasta is healthier than plain pasta because all of the wheat is included. 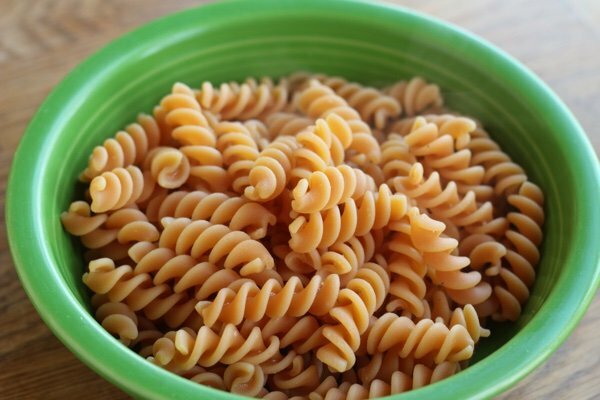 Whole wheat pasta is 20 calories less per 2 ounce serving than regular pasta and has more than twice the fiber as well as zinc and manganese (regular pasta has ZERO zinc and manganese) as well as a higher percentage of other nutrients such as niacin and potassium. Basically, since you are getting the nutritious part of the wheat included - you get more for your calorie bang. One great thing about pasta is that it is relatively high in protein. Both the regular and the whole wheat version have 7-8 grams for a 2 ounce serving. The high protein amount made me amazed that Barilla made Barilla ProteinPLUS which you can find in the yellow box. It boasts of 17 grams of protein on the box. How did they do it? They added “legume flour blend” which includes lentils, chickpeas, flax seed, barley, oats, and spelt. They also added egg whites. It is not made with whole wheat flour. This pasta cost me $2.89 for a box versus regular pasta ($1.55). You pay a premium for ProteinPLUS. I must say that I really liked this pasta (maybe more than the whole wheat version). It had a nice texture and was delicious. I may have liked it because it has less fiber (4 grams versus 7 grams) so it was less chewy. But what about the protein? It turns out that for a 2 ounce serving the protein amount is 10 grams!! You have to read the box very carefully to see that the 17 grams of protein is for 3.5 ounces. 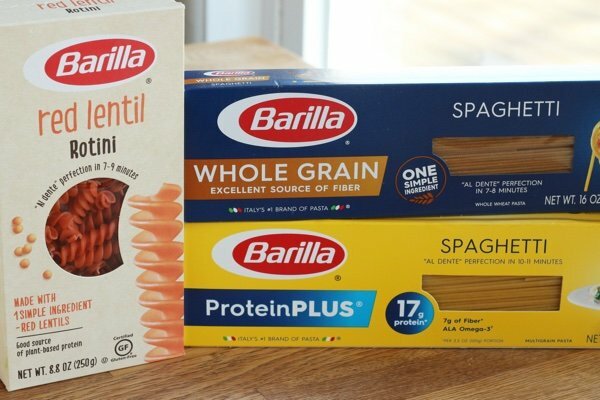 I think this is very deceptive of Barilla because most of us would have thought the 17 grams of protein was in 2 ounces as that is the amount of pasta on the nutritional facts label of the other pastas. Scandal! I also gave red lentil pasta a try because I thought this looked like a good idea. Use beans to make pasta! The red lentil pasta was the most expensive at $3.40 for 8.8 ounces (ouch). It is made with red lentil flour and has the most protein of all the ones that I sampled - 13 grams for 2 ounces of pasta (the truth). It is gluten-free and has 6 grams of fiber. I find it to be a healthy choice BUT it was not like wheat pasta. When you cook it, you can smell the lentils and the pasta is chewier even after I cooked it for longer than the directions. I added some sauce to it and I did like it BUT I would rather eat lentils. You can put pasta sauce on lentils and pay only $1.00 per pound! What do you think of the different pastas? Have you tried any of them? I get confused when shopping for healthy spaghetti pasta and usually purchase the whole wheat. I've tried the protein plus and like it but wonder if it's that much better since it's not whole wheat. I agree that the label is deceptive and only has a few grams more than whole wheat. I tried lentil pasta from Trader Joe's and found it grainy. Maybe I cooked it too long. So many choices! I eat the protein pasta-Barilla brand and did not realize that the serving size was 3.5 oz compared to 2. Very deceptive, thank you for bringing this to light. Love the Barilla whole wheat! I tried black bean pasta from Costco, and the taste as well as the texture was not to my liking. It was worth trying, but I'll stick to black beans instead. I have eaten whole wheat pasta like forever. Took my hubs awhile to like it, but he now does. Barilla is my brand of choice. Tried many others but the taste and texture is just off. My sister works for a natural foods distribution company and she sent me a box of pasta made from hemp! It was delicious! I loved the texture as well as the flavor. I enjoy experimenting. Thanks for your input! Thanks for this post, for including all the different options. Just yesterday, I was asking myself the same question, “which is the healthiest option?” I’m trying to lose weight, so I’m limiting my pasta serving size to 1/2 ounce. At that serving size, there doesn’t seem to be enough nutritional difference to matter. So, my son's doctor recommended the lentil pasta. I bought it and we tried it, and I concluded that other than the protein, whole wheat pasta serves the purpose well. We are looking to reduce dietary cholesterol, and both have the same amount. And, with the clost differential, it was a no brainer! Great discussion! I would like to try some of the other pastas that are higher in protein. I don't care if there is a one ounce difference in 2 oz. vs. 3.5 oz of protein. 10 grams of protein per 2 oz. is great. Women generally need more protein than men, but about 46 grams per day if you are sedentary, and for men about 56 grams per day if they are sedentary. More than anything, carb intake is primary. If you are diabetic, too many carbs can lead to a fatty liver and complications for the heart. "In addition to inflammation, too much sugar in your bloodstream can damage your artery walls, which leads to added inflammation. Your arteries carry oxygen-rich blood to your heart. Inflammation is a risk factor for coronary artery narrowing, which makes it difficult for blood to make it to your heart. “Having high blood sugar levels increases your risk for heart disease,” Patton says." However, carbs that are healthy are those with a high content of fiber. So when looking at labels, check how much of the carb amount is fiber. I tried whole grain spaghetti just once. It smelled rancid,which is why I never tried it again.I read years ago that whole grains should be kept refrigerated, and I think about that every time I look at whole grain products on the shelves. With regard to the difference in serving size of 2 oz for one product and 3.5 oz for another: this could be due to the changes in serving sizes. In 2017 they began changing nutrition labels and increased some serving sizes based on what people actually eat. Many haven’t changed yet, but I believe all must be in compliance by 2020. We eat a lot of spaghetti at our house! 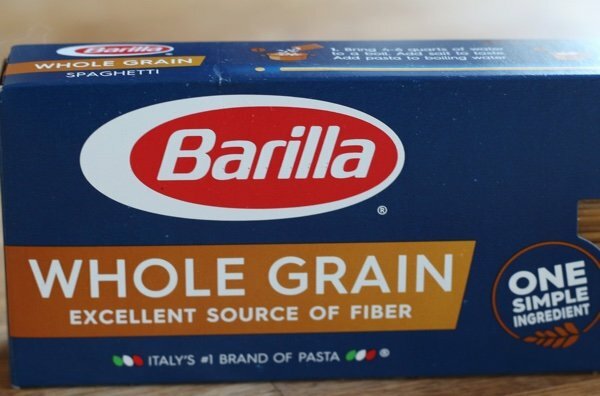 A few of my sisters decided they don't like the taste of the Barilla whole grain pasta. So, we now use half of Barilla's regular spaghetti mixed with half of the whole grain and you can't tell the difference. I am so sorry that I left out a very important fact about uncle Bens pouch rice. Buy the WHOLE GRAIN "BROWN RICE"
the other flavors are "LOADED W/ SODIUM" you will see the when you compare the Brown Rice to other flavors on the back.